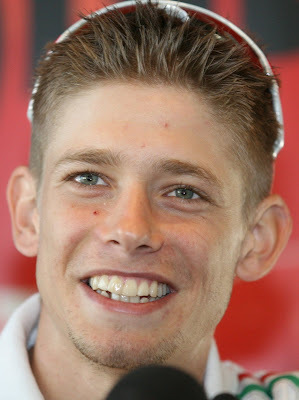 Casey Stoner has come from a family of motorcycle fanatics, who left their hometown of Kurri-Kurri to Europe to catapult Casey into the riding industry overseas. 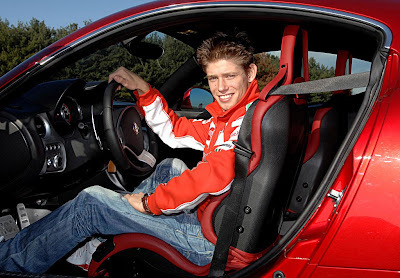 His World championship debut was as a wildcard in the Donnington and Phillip Island rounds in 2001. He finished 17th and 12th respectively. In 2002 he began his World Championship campaign in the 250cc class under the watchful eye and guidance of team boss and racing veteran, Lucio Ceccinello in the Salfio Carrera LCR (now known as Carrera Sunglasses LCR). He didnt do as well as he could have but a great rookie season was spent in the championship. 2003 began and he moved down to the 125cc Championship with the same team. 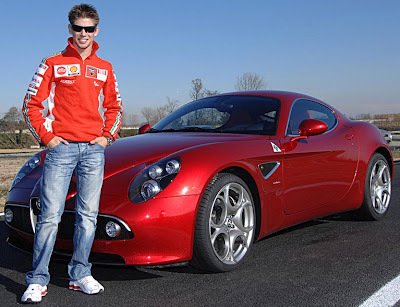 He went alot better than when he was in the quarter-litre class, winning in Valencia and proving to be a threat in the 2004 season. Then the announcement came that Casey would be riding for the Austrian Red Bull KTM squad alongside Finland's Mika Kallio in the '04 season. 2004 proved not to be Casey's year, with a broken Clavicle (collarbone) from a practice crash at the Sachsenring circuit proved to be the downfall. He was sitting comfortably in 4th spot in the championship with a great chance of taking the crown away from other contenders, Andrea Dovizioso (later crowned champion at the Sepang circuit), Hector Barbera, and Roberto Locatelli. With his injury to the left clavicle, he couldnt race in the Sachsenring race and then the following one in Great Britain. then a disasterous 3 rounds followed, crashing out in Brno, A coming together with Simone Corsi (for which our Casey took the blame, missing a gear) and Motegi.... But in Malaysia, a twist of fate happened and he wrenched the lead of Andrea Dovizioso and won his second race in the class (Also the first win for KTM in the class). A well-deserved third (well he came equal second but was relegated to third due to the fact that Jorge Lorenzo clocked a faster time on that last lap) on his home turf at Phillip Island was amazing to watch, I was lucky to witness it in person! But in Valencia (the site of his first win) he wasnt as lucky, crashing out. in 2005, he re-appeared in the 250cc category and immediately took it to reigning champion Dani Pedrosa, sitting in a comfortable 3rd place in the opening round in Jerez. 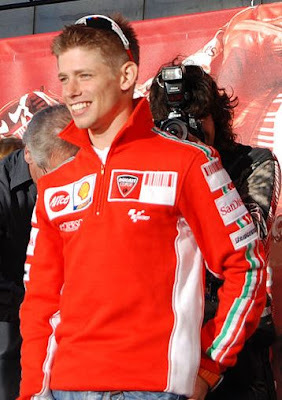 That's all make Casey Stoner to be hot biker. hello!,I like your writing very a lot! proportion we keep in touch extra approximately your post on AOL? I require a specialist on this house to unravel my problem. Maybe that is you! Looking ahead to see you. What you published made a ton of sense. However, think about this, what if you added a little content? I mean, I don’t want to tell you how to run your website, but suppose you added a post title that makes people want more? I mean genCRM – VÃ¹ng bÃ­ máº­t » Nhá»¯ng cÃ¡ch Ä‘áº§u tÆ° vÃ o má»‘i quan há»‡ vá»›i khÃ¡ch hÃ ng! is a little boring. You might peek at Yahoo’s home page and watch how they write post headlines to get viewers to open the links. You might add a video or a related picture or two to grab readers excited about what you’ve got to say. In my opinion, it would bring your blog a little bit more interesting. Took me time for it to have the ability to understand all with the comments, however I truly appreciated this write-up. This turned out to be Invaluable to my opinion and I’m certain that to everybody this commenters below! Itâ€™s undoubtedly great each time a specific person are unable to just learn, but additionally interested! Iâ€™m certain you necessary enjoyment penning this type of write-up. organic gardening right in your own back yard. Wood can be used as long as it's not treated with chemicals. the mixture in the palm of your hand and apply and hold your hair and scalp.